Joshua Barton (left). Pic by PressEye Ltd.
A thoroughly entertaining match at Knockramer Park saw six goals shared between Lurgan Celtic and Knockbreda. A tame opening 20 minutes was brought to life courtesy of a Knockbreda tap-in, however the game swung back in Celtic’s favour shortly after the half hour mark, as strikes from Ryan and Barton put the Lurgan side into a 2-1 lead. Two quick-fire Knockbreda goals within five minutes of the re-start put Knockbreda back in front, however the final goal of the match came on the hour mark from a sublime free kick from Lurgan substitute Hutchinson and so the match finished in a deserving 3-3 draw. This week Celtic make the journey to Drumahoe to take on Derry side who suffered a 6-0 humiliation at Larne last week. It is a result that has Institute captain Stephen O’Donnell claiming the north west men will relish Celtic‘s visit as a chance to set the record straight. “Everyone in the squad let the manager down and the club down with that performance at Larne and because of it, we can’t wait to play Lurgan Celtic this weekend,” stated O’Donnell. “We know ourselves that it wasn’t good enough at Larne, but we have drawn a line under it now and it’s behind us, what we want now is to have a good hard week’s training and take that into the Lurgan Celtic game. Celtic sit just two points behind ‘Stute in the table and both club will have aspiration of promotion. “We know it’s not going to be easy, because Lurgan have been scoring goals, but everyone was at training on Monday night and talking about how much they were looking forward to this weekend’s game,” added O’Donnell. “Defensively we were shocking last week. I don’t think any single player could say that they did okay, it wasn’t good enough and it can’t happen again. 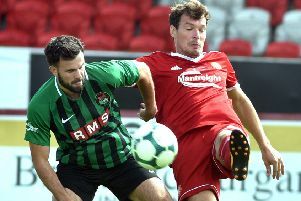 Institute should welcome back defender Daryl McDermott from suspension and Gareth McFadden should also be available, but duo Mark Scoltock and Sean McCarron miss out and if Celtic can get services to the likes of James Wright, who bagged a hat-trick against Annagh recently, they could cause the home side problems.